Like the name suggests, a pyramid chart has a triangular structure. Lines run across it, dividing it into sections with thicknesses proportional to their values. 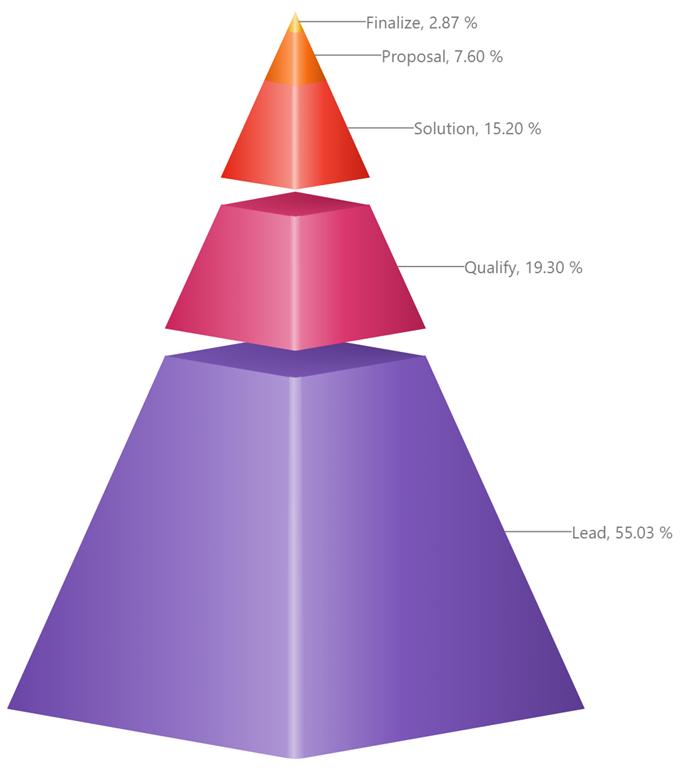 A pyramid chart represents data in the form of percentages, with the whole chart representing 100%. A pyramid 3D chart built with Collabion helps you visualize the total data, as well as the hierarchical structure of it, in the form of a pyramid-like structure. A filtered pyramid chart, on the other hand, is represented in the form of a graduated glass pyramid filled by liquid, where the graduations indicate the values of different sections after data filtration. Users who buy the paid version, and so on. Under normal circumstances, this would likely give you gradually diminishing values, and help you benefit from the visualizations provided by a Pyramid 3D Chart. Sort the data in the chart. Having large and small values in a haphazard manner will make it difficult for viewers to understand the data or attempt to find insights from it. Click on one of the segments to make it pop out. If you have built multiple charts with related data sources within the same dashboard, then this will also filter the other charts based on the segment you have clicked. Hover the pointer over one of the segments and the tooltip will give you a snapshot of the data without having to switch back to the data source. If you click on a segment in another chart built with a related data source within the same dashboard, then the data of the pyramid chart will be filtered according to the segment of the other chart. After that, hovering over the segments of the pyramid chart will show even more data. Try to avoid using lighter shades of colors in the chart. When used in a 3D chart, making out details over such colors can be quite taxing on the eyes.